Hi dearest followers, hope all is good in your world. This weekend saw me and fellow nature freaks out in the wilds of Purdis Heath, my local patch. About 13 of us had gathered to help clear the heath of saplings, gorse and bramble. This is important habitat maintenance work to help the Silver-studded Blue (SSB) butterfly (Plebejus argus) maintain a foothold here after numbers of these beautiful insects plummeted around the turn of the century. Butterfly lays egg on flower of plant. The egg hatches, eats the flower then falls to the ground. Here it lays looking all helpless and defenceless until an ant comes along. Not just any ant, but a Myrmica ant, the larvae is thought to emit a pheromone that makes the ant think the larvae is in fact an ant larvae. The confused ant, thinks what's this doing here? I must take it back to the nursery immediately. Once in the nursery the ants care and feed the larvae until it is ready to pupate. It then emerges as a butterfly from the ant nest and the cycle is ready to begging all over again. Once this cycle was discovered, it was realised that all the time they were trying to save the butterfly, they should've been paying closer attention to the ants instead. Because the ant habitats were becoming over grown, which were causing the ants to move away from where the butterflies were. So the butterflies weren't being carried down into the ant nests and thus the butterflies were declining. Unfortunately, by now, the Large Blue was extinct in the UK. But all was not lost as there were still some healthy populations in Europe and a plan was put in place to re-introduce the Large Blue back to the British countryside once again. So the habitat was managed in favour of the ant populations by introducing grazing animals such as ponies and sheep and once the ants were doing well and thriving, specimens from Norway were re-introduced and till this day, they still exist. This is a lovely example of the important and amazing interrelationships that exist within nature where a butterfly is reliant on a grazing cattle to breed. The SSB is also reliant on ants in the same way and therefore, parts of the heath have to be maintained for the ant populations to thrive. Dry, encrusted areas of bare sand are good for ants as well as some other wonderful insects and me and Jackie wasn't into long lopping the brambles when I came across this little fellow. A male Minotaur Beetle (Typhaeus typhoeus). Just look at those little horns. These lovely looking beetles are the beetle partly responsible for making holes in and around the sandy part of the heath. 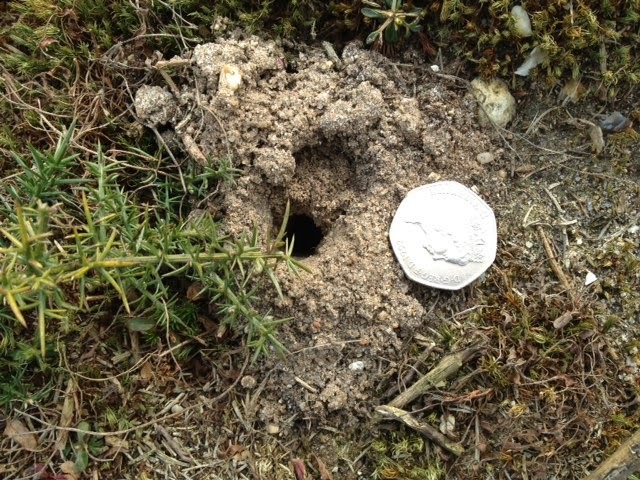 One of the many holes dotted around the sandy parts of the heath. Not every one has a 50p next to it though. I posted the photo above in the early part of the year trying to find out what was making them. In the early part of the summer I came across an old favourite of mine, the Green Tiger Beetle (Cicindela campestris) and thought these were responsible for the holes. However, even at this time of year, I could tell from the fresh mounds of sand being piled up that the holes were still active, and yet, Green Tiger Beetles aren't active this time of year. So something else had to be responsible and here it is, the Minotaur beetle. These lovely looking shiny beetles eat the many rabbit droppings that litter the heath and drill deep into the ground, up to 12-18" deep, where they pull the droppings down to feed their larvae through the winter period. As you can also see in the photo above to the left is a gorse sapling. This too needs to be kept in check as it spreads quite rapidly and quite easily. It's also quite amazing how deep the roots of these plants can penetrate the sandy soil. A small sapling of gorse dug up by Ann. Just look how long that root is! So just by seeing the photo above, you can see that we have our work cut out in keeping certain plants at bay and in the right places. Jackie and Helen busy removing the brambles that spread so quickly. It wasn't all about work though, we had tea breaks where Matt & Julian laid on tea and biscuits for us and we got to have a good chat in the lovely weather too. I'm also happy to report that whilst we were busy attacking the brambles I came across 4 ladybirds and they were all native 7-spots (Coccinella 7-punctata) which I recorded with the iPhone ladybird survey app. One of the ladybirds was dead, after all, it is that time of year, but it was recorded all the same. Sorry for the poor quality, never had me glasses on. Not all the work involved cutting back the bramble and gorse, there was wood from previous work parties that needed to be moved in preparation for dead hedging and habitation piles. The silver birch, as pictured above, was the birch that was used as a form of corporal punishment. It is believed that birch was used because of it being white in colour. The early Christians believed that white was pure and free from evil and therefore, good for beating the evil out of those who do corrupt things. So there you go, another piece of useless information you never knew you needed. Another part of the heath is the archaeology pit which was dug some time ago to see if there had been any activity on the site. Not many people realise this, but the east side of Ipswich has several burial mounds that date back ~3500 years. In fact, just up the road in Woodbridge, there is the famous Sutton Hoo ship burial site. In the opposite direction down the A12, we come to Colchester, the oldest recorded Roman town in Britain, so it would seem that this part of East Anglia is steeped in history. This pit was never filled back in and has now become its own micro-habitat and has to be kept free of the gorse that is now encroaching upon it. Matt Berry of Butterfly Conservation bravely went into the fray with strummer to cut as much of the gorse back as possible. I say bravely because unless you've ever been spiked by gorse, you will never know just how vicious the stuff is! Anyway, the day went well and the weather held out. 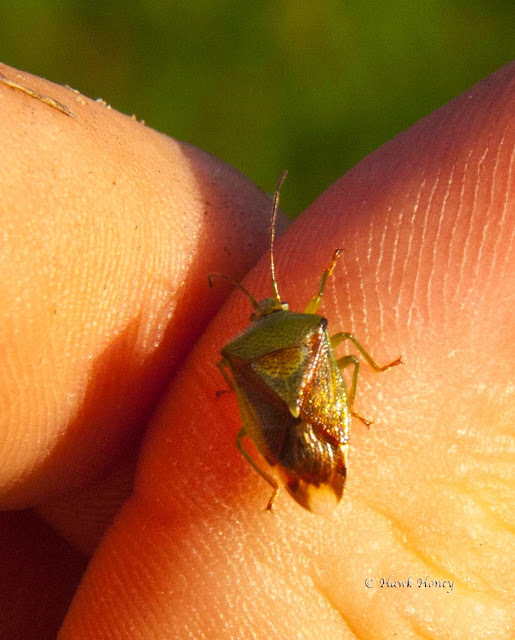 So much so there were still plenty of insects flying around including a queen bumblebee and this lovely little shieldbug which stopped and joined us for lunch on Ann's shoe. All in all, a good day was had and lots got done. It's a nice way to give something back and good for your health too. You get to meet lots of nice like-minded people and learn more of what's happening in your area through this networking. The next work party is on Saturday 7th December, weather permitting and it would be lovely to see you regardless of your abilities. There's something for everyone to do at the work parties and it beats sitting around watching telly or shopping! Till next time dear followers, take care. Leaves, Starlings and a Sparrowhawk too!